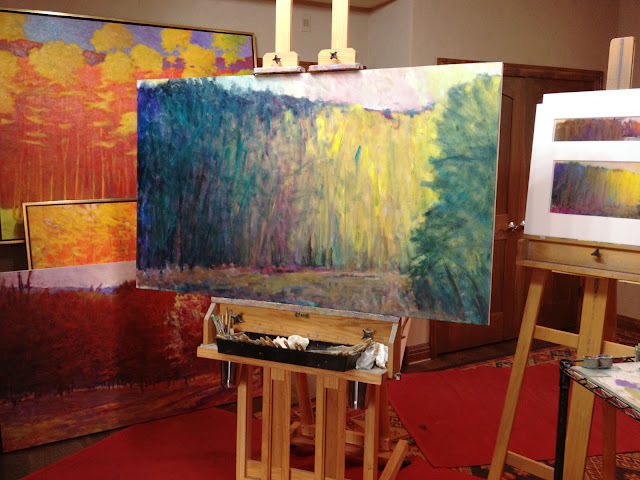 On the easel is a 3x5 foot canvas coming from the pastel at the right. I'm two sessions in and this oil is coming along nicely. I say nicely because I'm not getting fussy, so I'm not bogged down and overly concerned about small, frustrating details. My concerns right now are the overall shapes, color and contrasts of the oil. I'm going to continue to add power by any means and go for a dramatic painting that simply expresses the flow of color and light across the canvas. At the bottom left on the floor is a 2x4 oil of red trees. Behind that are two finished canvases in frames. It's the red zone back there. Little did I know that after this photo was taken, the lovely rain outside turned into an hour long hailstorm, leaving 3-4 inches on hail everywhere. What an amazing racket! By the way, for those of you following the birds nesting on my front door wreath, they are fine and looking like bird geniuses for nesting under the front door overhang. Baby bird photos will be coming when the eggs hatch. A two-day workshop in Denver, Sat-Sun, July 21-22. My compliments, dude! This will be a very great finished oil, I already feel it. thanks Casey! Hope your exhibit is going great! Wish I could come get a color fix! This sounds like great fun! If not this workshop, then the next one. It would be great to have you here!